Anna Trent is furiously working away in a chocolate shop in Paris, stirring, creating and mixing the best chocolate in Paris. It's fair to say that this chocolate shop is a far stretch away from the one she worked in back in England, luckily Anna was given the chance of a life time as her old French teacher sends her on a trip, that will prove to be one of the toughest journeys she's been on. Now I'm a complete novice when it comes to Colgan's books, I spotted this in the supermarket on special offer and the fact that it had the word 'chocolate' in the title totally swayed me into buying it, I'd not heard anything about it and went into reading it from a completely neutral standpoint. When I came out the other side having finished this novel, having cried, laughed and cried some more, I was on the 'OMG i love this book everyone has to read it' side. Yes I adore this book. It was not what I expected, I thought standard chic-lit, soppy, romance, bit of a story line, easy to read and a bit puke worthy due to the over romance of it all. However this book had so much more to it. Heart-break, illness, a lifetime of lost loves and of course romance. I cried not just once but many times through this book (especially at the ending). It's a book that makes, you think, makes you realise that you can't waste a moment! Anna Trent is our leading lady and she is such a lovely character to follow, as she journeys across to Paris you feel her anxiety and nerves as she goes about living in a new city. Gradually more and more characters are introduced and there is only one that I disliked but all the other characters disliked her too. 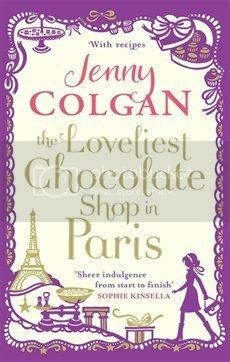 This book made me want to move to Paris and open up a chocolate shop even though I don't know the first thing about making chocolate (I do however know ALOT about eating it!). Recommended for all chic-lit fans or fans of Paris as I'm sure there are lots of places you'd recognise if you have visited yourself. Chick lit is very hit and miss for me, but, like you, I have been sucked in by the title! You make it sound like one of those fantastic chicklit novels and I think I might have to keep an eye out for it now.